The month of March is over and India celebrated one of its most exciting festivals Holi across the country. Holi is the festival of Colors, celebrations, brotherhood and endless parties. Holi is a two-day festival, where the first day we worship fire to celebrate the victory of good over bad and on second-day people play with colours. Bhang, Drinks, Colours, Thandai, Dance and the people happily messing with each other fill the environment with the joy and excitement. Everybody throwing splashes of colours, mud and water on each other makes Holi, one of the most vibrant festivals in the world. The Charm and fervour of Holi inspired the other countries in the world to organize a similar festival across the world. There are plenty of festivals around the world which are celebrated by throwing Tomatoes, Eggs, Vegetables, Mud or Flour on each other. I have curated a list of festivals around the world which are similarly crazy and enjoyable as Holi. The Battle of Oranges – Italy. Boryeong Mud Festival – South Korea. Battle Of Wine – Spain. Chinchilla Watermelon Festival – Australia. Galaxidi Flour Festival – Greece. Glastonbury Music Festival – Britain. Thailand’s New Year Day is celebrated as the Songkran festival. People of Thailand celebrate their new year by throwing Ice-cold water and colourful paste on other people. 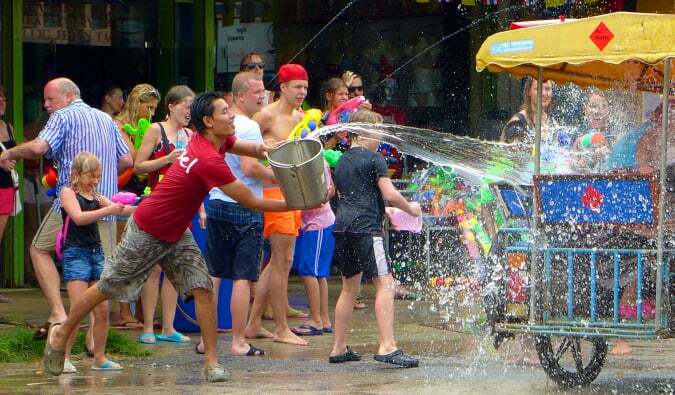 People run around the streets and throw Ice-cold water and coloured paste using buckets, balloons and water-guns. This festival in Thailand is celebrated from 13 April to 15 April every year. This three-day festival is the best option to get a similar experience like Holi in Thailand. 2. The Battle of Oranges, Italy. This festival is known as the largest food fight in Italy. 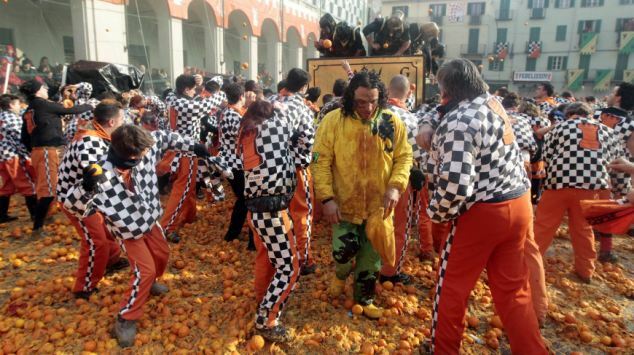 The Battle of Oranges is mainly celebrated in the Ivrea city of Northern Italy. People divided themselves into two teams and throw Oranges on each other. People throw oranges for a full day and in the evening streets of the city get filled with messy orange juice. This festival is celebrated in February month and more than 400 Tons of oranges used during the day. The battle of oranges is something like Holi which is played by oranges instead of colours. Do you remember, Zindagi Na Milegi Dobara? If yes, then you should also know about La Tomatina Festival. La Tomatina festival is celebrated on the last Wednesday of August, every year in Bunol town of Spain. People throw messed tomatoes on each other and enjoy the event with drinks and dance. La Tomatina festival is getting popularity and thousands of people come to attend this festival from around the world. 4. Boryeong Mud Festival, South Korea. 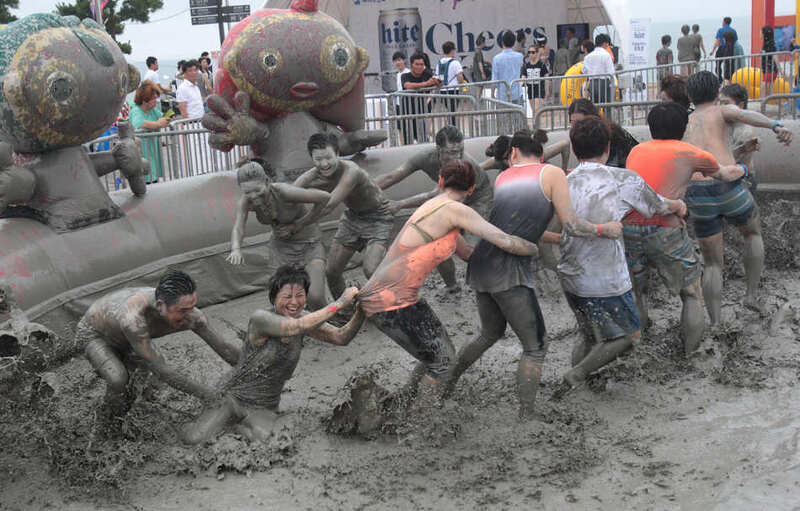 The Mud Festival is organized during July month in the Boryeong town of South Korea. When we go to the rural areas of India, where Holi is played using mud and sand. This festival is quite similar to that. Festival is organized on beach sides of Boryeong and people happily mess with mud, they jump in the mud, massage with mud lay down in the mud and there are numerous mud activities held to enjoy. This festival was started in 1998 and for now, there are more than 30 Lakh people and tourists attend the mud festival every year. 5. Battle of Wines, Spain. Spain has popularly adopted festivals like Holi which required to mess with colours or other things. Haro Wine Festival is one of those festivals where people enjoy the event insanely. Haro Wine Festival or Battle of Wines is celebrated every year in Haro town of Northern Spain. People come with buckets and bottles of Red Wine and pour it over others. Wine drinking competitions are organized during the event. People get soaked in drinks from top to bottom and the adorable smell of wine make the environment so good to enjoy. 6. Chinchilla Watermelon Festival – Australia. The Watermelon festival held every second year in February in Chinchilla town of Queensland, Australia. Chinchilla is also known as ‘City of Melons’. 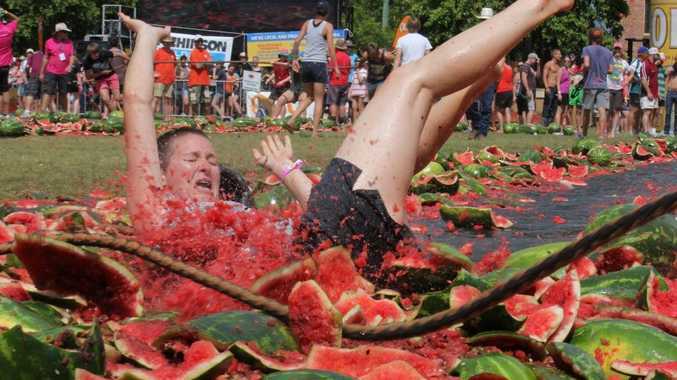 People mess and smash watermelons with their heads and throw them over each other. Festival witnesses numerous activities related to melons like Melon Skiing, Melon Eating Race, Melon Chariot, Melon Bungee and many more. Festival held in the month of February. 7. Michigan’s Annual Mud Day, USA. 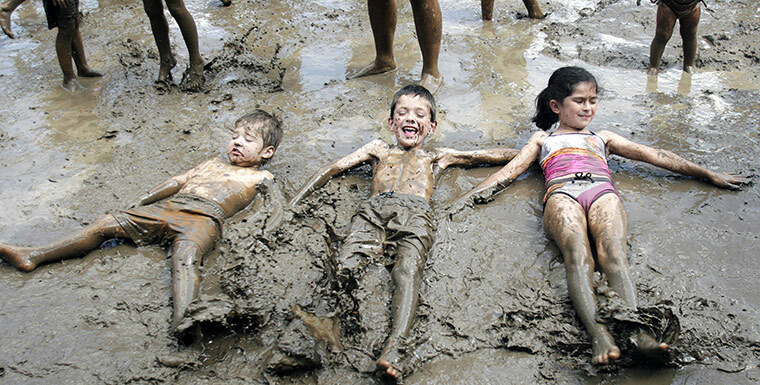 People and youngsters of Michigan city are now celebrating their annual Mud day for more than 28 years. They build an artificial pond of mud and play in it for the whole day. People get to lay down in the mud and do messy activities for fun. At the end of the event, people choose Queen and King of Mud according to the creativity of messing with mud. 8. Galaxidi Flour Festival, Greece. This festival is much similar to Holy in India. While Holi is played with colours, in this festival people play with flour. Galaxidi flour festival is celebrated in Galaxidi town of Greece every year in February month. People throw flour over each other and everybody gets entirely covered in the different types of flour. People covered with flour perform multiple fun activities like dancing and singing. Thousands of people from the country take part in this festival. 9. Glastonbury Music Festival – Britain. Glastonbury Music Festival is one of the best music festivals held in Britain. Thousands of people and hundreds of artists set the atmosphere on fire. During the event Dance, music, singing, comedy are some of the activities which are performed. The best part of this festival is slinging in the Mud. Excited people lay down in the messy mud and insanely enjoy playing with it. Above festivals are different from each other as they celebrated but the energy, enthusiasm and the flavour remain the same as of Holi. Please tell us in the comment that which festival from above, you want to attend. Next article 11 Best Places to visit for First time Solo Travellers in India.